David Clarke To Take Trump Administration Job - Joe.My.God. 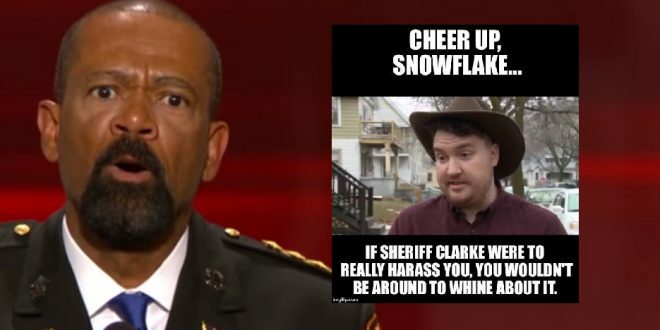 David Clarke, the controversial outgoing sheriff of Milwaukee County, Wis., is expected to take a job in the Trump administration, according to two sources familiar with the matter. Clarke resigned as sheriff on Thursday. A regular presence on Fox News, Clarke has become a well-known figure in conservative circles in recent years. He is also an avowed supporter of President Donald Trump, and he spoke at the Republican National Convention in Cleveland last year. But he has come under fierce criticism amid a series of deaths in the Milwaukee County prison, including that of Terrill Thomas, who died of dehydration last year after guards turned off the water in his cell. Trump has been one of Clarke’s most vocal cheerleaders, and even promoted his book on Twitter earlier this month.